I thought I would take a break from posting about my project “Portraits of American Teens” and show you my most recent commission, especially since it’s a departure from the oils I have been working on. This piece was done primarily with colored pencil with a little pastel. 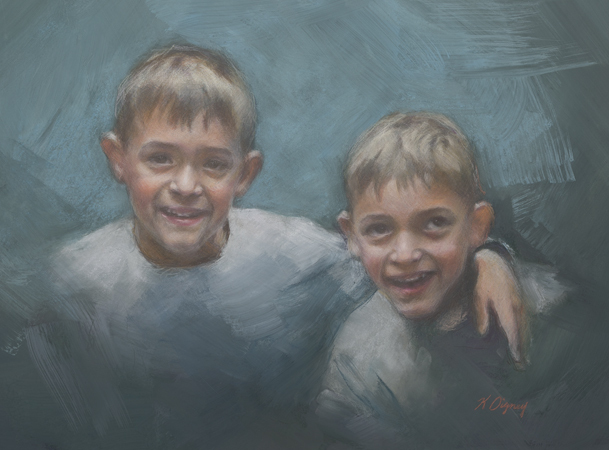 Gavin and Cole are twin brothers who live in Michigan and this portrait was commissioned by their grandmother for her husband’s 70th birthday. I just delivered it a few days ago to another happy client. I always feel very blessed when I am able to create a piece of art that has so much meaning for families. It truly is special to be able to share in their experience. I was also able offer a giclee of the portrait to pass on to another member of the family. The pose was perfect for capturing the boy’s personalities as well as their special relationship. Cole, the twin on the right has cerebral palsy. Gavin’s arm around Cole captures the special bond that exists, yet also portrays Gavin as Cole’s protector. For my primarily colored pencil pieces, as this one is, I adopted using pastels for my backgrounds after participating in a workshop by fellow portrait artist, Judy Carducci. She does amazing pastel portraits and uses a sponge to wet the pastel after blocking in the back. I have experimented using various sponges and sometimes big brushes which add cool textural and abstract effects.